Until the middle of 2016 Taiwan was mysteriously absent from trip reports. Here was an island, with a bunch of endemics, that no one seemed to visit for the mammals. 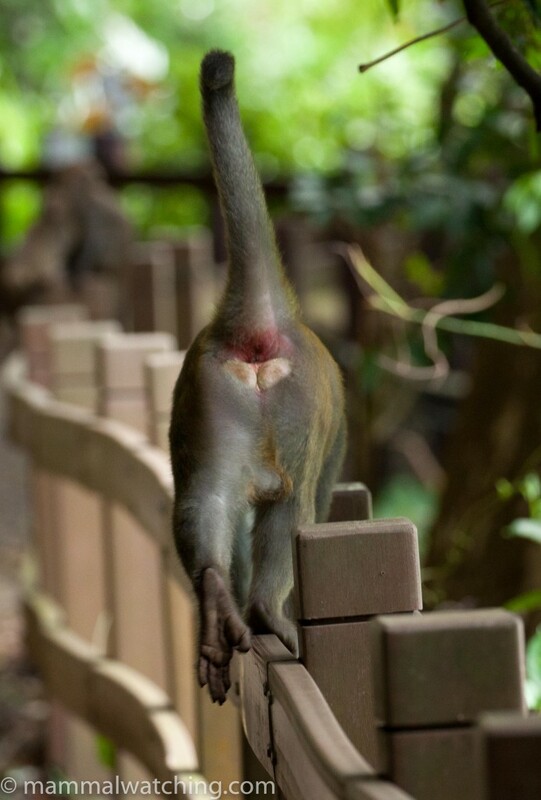 I assumed – quite wrongly it turns out – that the mammals must be very hard to see. And then two trip reports arrived back to back, from John Wright and Dominique Brugiere, and changed my opinion. A few weeks later I met Kuan-Chieh “Chuck” Hung at the British Bird Fair and started to plan a visit in August 2017. 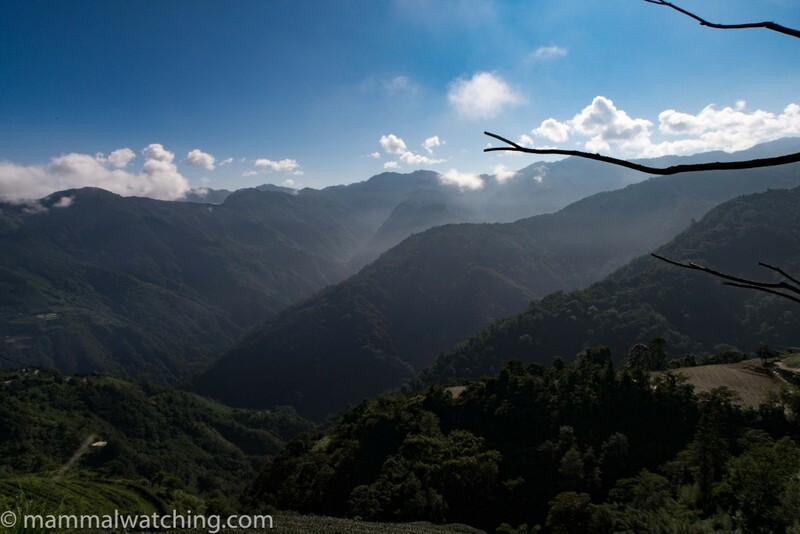 I visited Taiwan for just seven nights with my kids, as the last stop on an Asian vacation. I tried to keep the schedule fairly relaxed to avoid a teenage rebellion. In the end it was more relaxed than even they had wanted: two typhoons hit Taiwan in quick succession the day we arrived and we were grounded in Taipei for three nights, not the one I had planned. 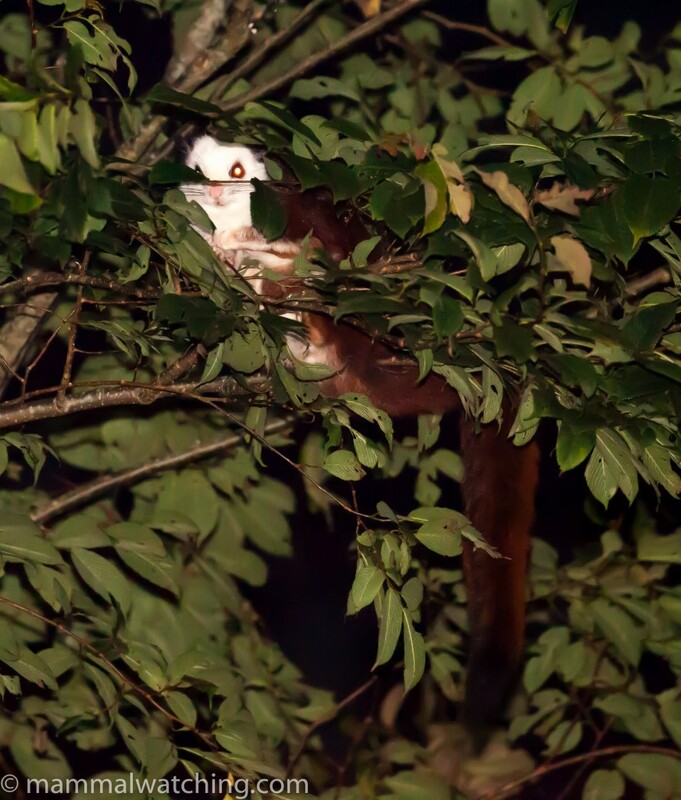 My key targets were the two larger Taiwanese endemics, the Taiwanese Macaque and the Formosan Serow, plus the Taiwanese subspecies of Red and White Giant Flying Squirrel, which, like so many of the mammals on the island, is likely to be split. 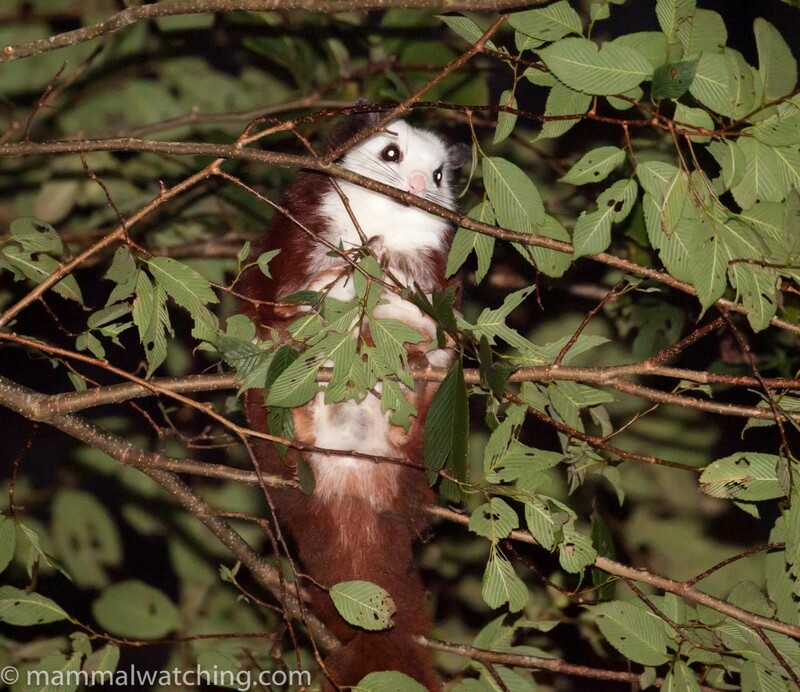 Though I had seen this spectacular squirrel before in the Qinling Mountains of China, I wanted to photograph it and see it again after looking at John Wright’s pictures. I also wanted to see as many of the bats and smaller mammals as I could. 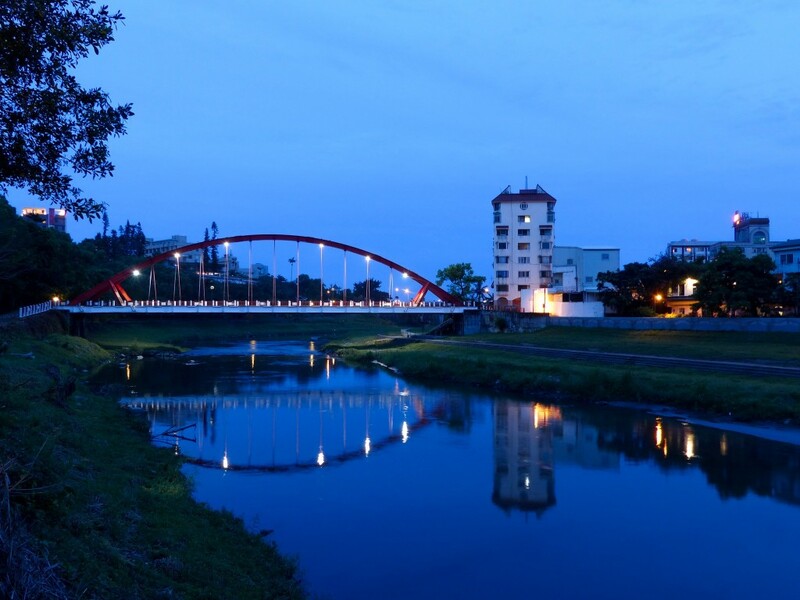 Taiwan is – language barriers aside – an easy place to travel around. If I was only chasing the larger mammals I could have probably done so on my own. 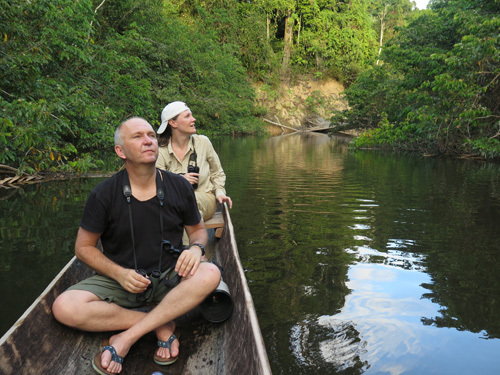 But catching bats and rodents in any of the protected areas requires a permit and so I teamed up with Chuck. 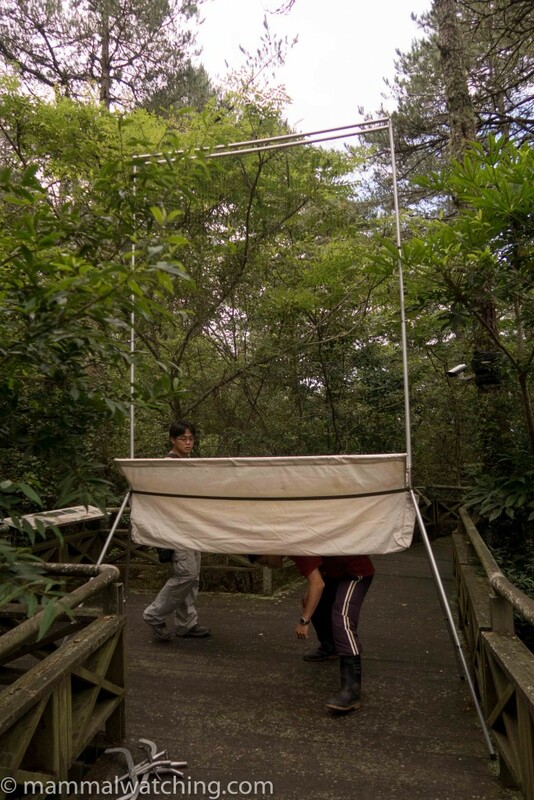 And Chuck teamed up with Chao-Lung Hsu, head of the Bat Conservation Society of Taipei, so we could use traps. Both Chuck and Chao-Lung were great: they organised everything very well, were knowledgeable and were good to travel with. Taiwan was not what I had imagined. It is very beautiful, very green and in many ways seems closer to Japan than to mainland China: spotlessly clean, safe drivers and unfailingly courteous people. 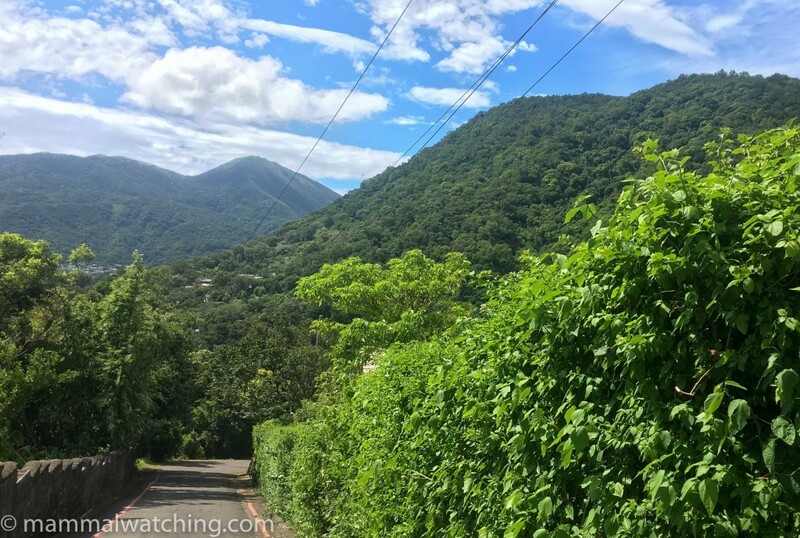 Our original plan was to visit Hualien City, on the north east coast, Yulin County, on the north west coast, the Guanwu Forest in the northern mountains and then the Dasyueshan Reserve to the south of the same mountain range. But the two typhoons meant we had to cut our plans at the last minute, and I opted to skip Dasyueshan . Although this would mean missing the Serow it did mean we could catch bats, as planned, for two nights. I figured I could always return to Dasyueshan on my own one day. We arrived into Taipei on Friday night. Most of our weekend in Taipei was spent sheltering from the rain and we delayed meeting up with Chuck and Chao-Lung until the monday, when it would hopefully be safer to travel out of the city. 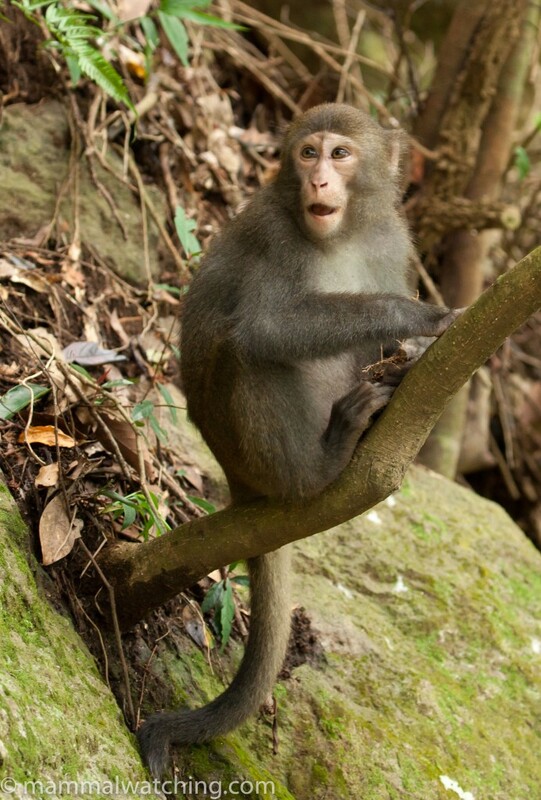 The weather cleared on Sunday afternoon and – after 10 minutes on google – I took the kids to the Old Tianmu Trail near the Chinese Cultural University to look for some endemic Taiwanese – aka Formosan Rock – Macaques. The trail is well signposted and you can take an Uber, for example, to No. 10, Lane 12, Aifu 3rd St, Taipei City which will drop you at the top of the trail. Just follow the signposted path down the mountain for 45 minutes and you are back in town. It is a nice patch of forest for somewhere so close to a big city. 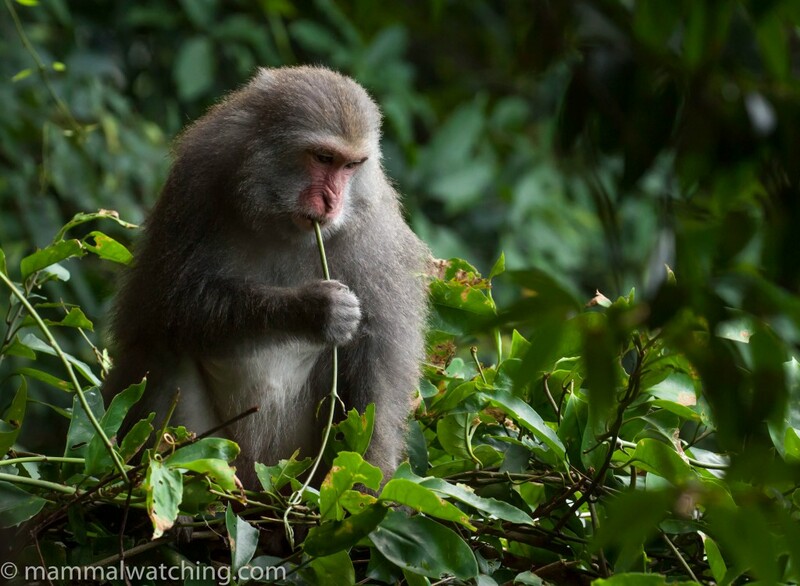 We found the macaques about 30 minutes down the trail, not long before the long flight of steps that lead down to the Zongshan North Road. They were aggressive: grabbing onto one person’s ankle presumably in the hope for some food. Just before sunset I visited the Fuyang Eco Park, downtown, to take a look for the Formosan Giant Flying Squirrels that are reputedly common in the park. According to several websites the park even has a special “Flying Squirrel Observation Zone” though I couldn’t anything indicating that particular area when I was there. It is a tiny park. 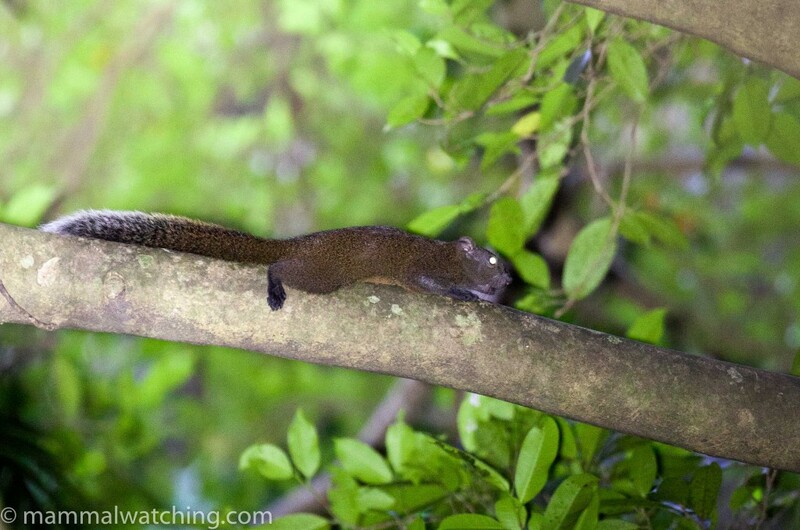 I heard several Pallas’s Squirrel right on sunset, and about an hour after dark saw several flying squirrels. A network of steep stairways up the hill the park is built around meant I could get to eye level with a couple of them. 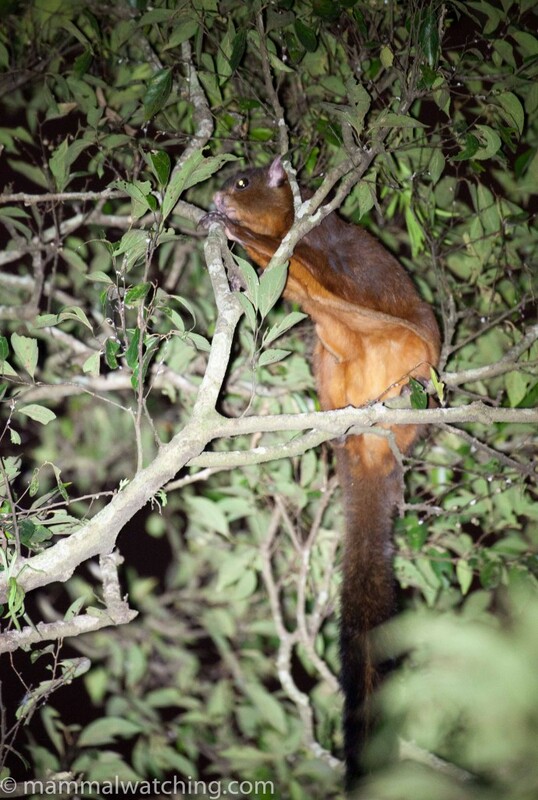 Several information sources give conflicting advice on whether the species in Taiwan are Petaurista petaurista, the Red Giant Flying Squirrel or Petaurista philippensis, the Indian Giant Flying Squirrel. According to the IUCN Redlist the Taiwanese species are P. philippensis, though, as the IUCN note “Even Petaurista philippensis possibly represents a complex of several similar species.” and so I wouldn’t be surprised to see Taiwanese form split into Petaurista grandis at some stage. In any case, its worth a visit for a couple of hours if you are in Taipei. The park backs onto a larger mountain so I wouldn’t be suprised if other species, including Chinese Ferret Badgers, turn up from time to time. 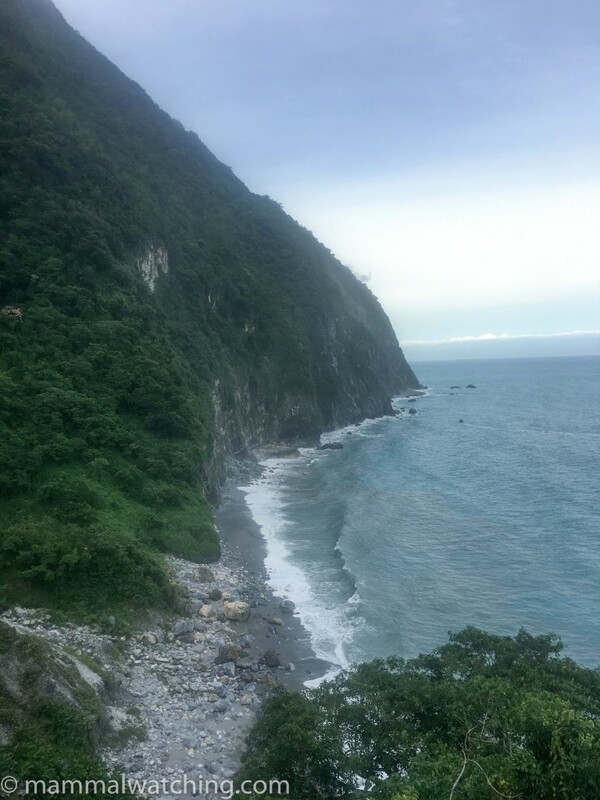 We met up with Chuck and Chao-Lung on Monday lunchtime and drove the five hours to Hualien City, the last couple of which were along a beautiful stretch of coastline: all forested limestone mountains coming down to the sea. We heard a Reeve’s Muntjac barking when we stopped for a photo. 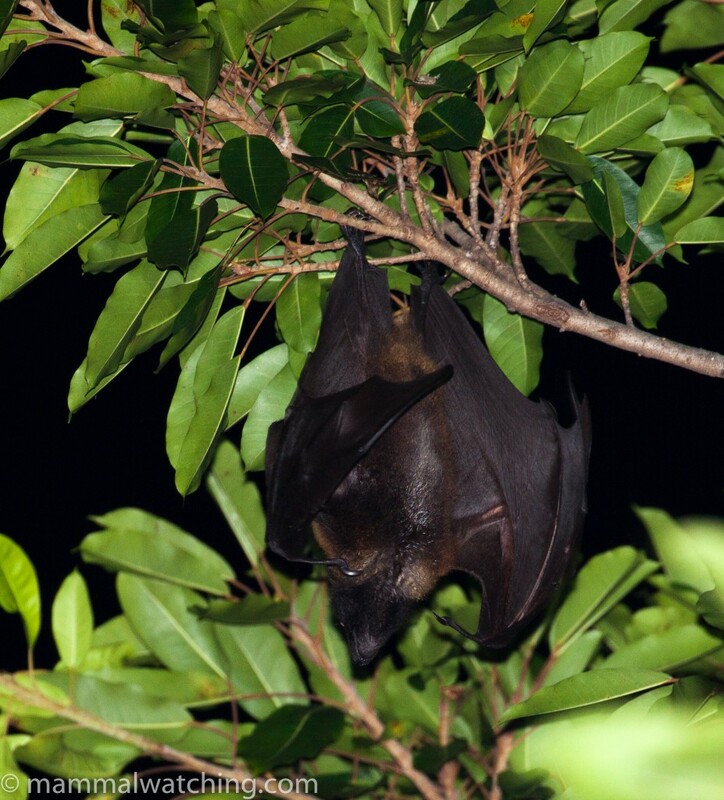 We visited Hualien City to search for the critically endangered subspecies of Ryukyu Flying Fox. 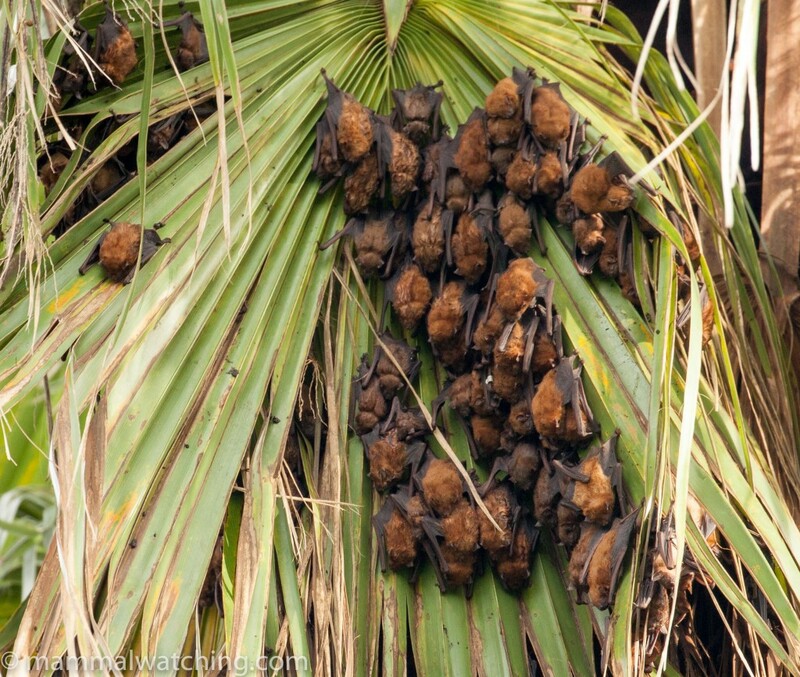 Between 1976 and 2005 these bats were thought to be extinct in Taiwan. 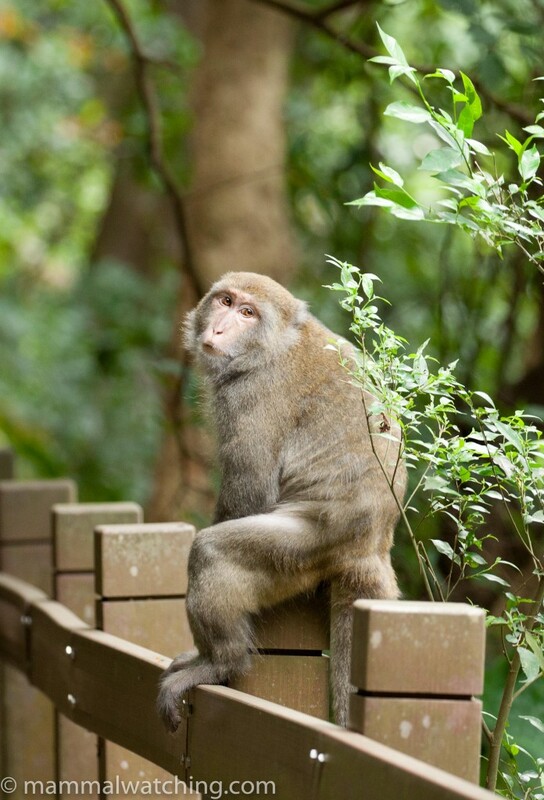 But in 2006 the species was rediscovered on Turtle Mountain Island off of the east coast of Taiwan. Since then animals have been recorded in Hualien City though I don’t think anyone knows where they roost and there is no guarantee the can be found every night. Flying fox habitat, Hualien City. Photo Katy Hall. The species is clearly far from common. Chao-Lung advised us to focus on patrolling the river in Hualien around Beibin Park, just before it joins the sea. 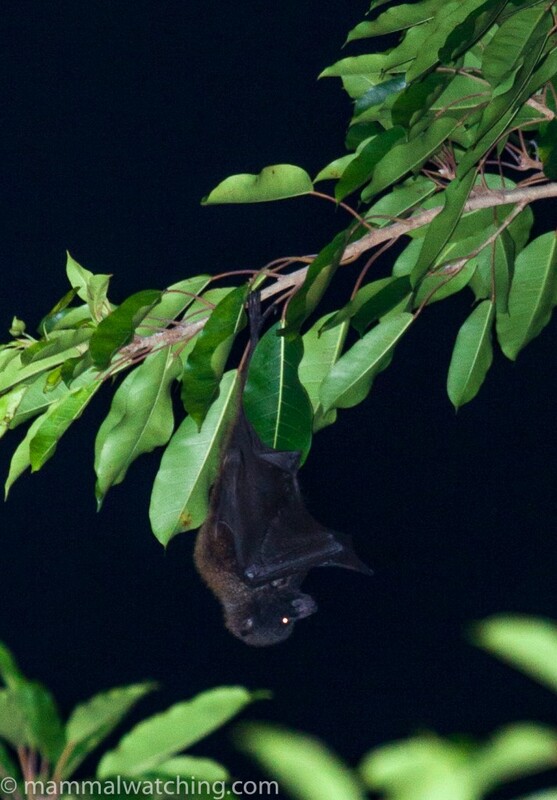 We saw a couple of flying foxes not long after sunset, and my heat scope found this young animal feeding in a tree along the footpath on the east side of the river, close to the footbridge. There were many small bats flying around before sunset that Chao-Lung confidently identified as Japanese Pipistrelles. We left early the next morning for the long drive to Hualien City, via Taipei (where we collected a harp trap). Our destination was the Golden Bats Home in Yunlin County. Here we met Heng-Chia Chen, who runs the small museum and bat conservation work, out of a primary school where a few lovely Hodgson’s Myotis roost in trees in the school yard. There are many bat boxes around the school. 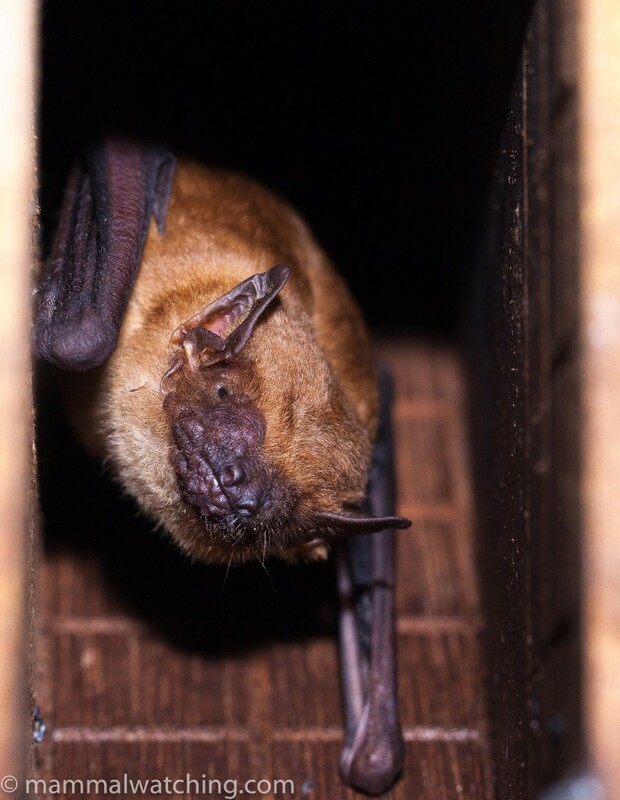 These may have been installed to try to provide a home for the myotis, but the only residents were numerous Japanese Pipistrelles and Asiatic Lesser Yellow House Bats. How great that these bats can happily live next to the classrooms. I suspect attempts to do something similar in most countries would be met by a wave of opposition from ill-informed, nervous parents. A great little spot, and it was about now I started to really appreciate the way they do things in Taiwan. 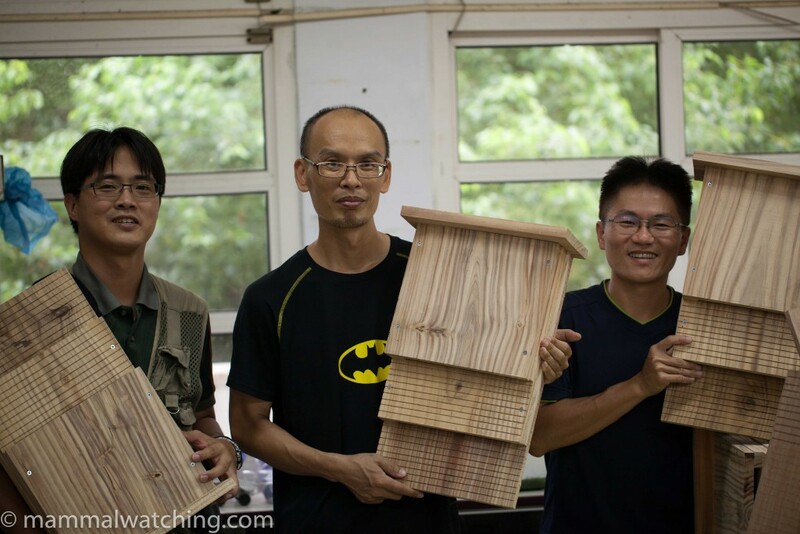 From left to right: Chuck, Heng-Chia and Chao-Lung model some bat boxes. We left the museum and headed towards Hualien City, via the Aogu Wetlands, a bird reserve, due west of Hualien on the coast (more or less here). We stopped outside the visitor centre to look at a palm tree next to the road that was home to a large colony of Asiatic Lesser Yellow House Bats. Again, how nice that they are left undisturbed. We spent the night in Hualien City and ate some spectacular street food in the night markets. It took about five hours to reach our cosy – and very friendly hotel – about 2000 m up the mountain and on the edge of Shei Pa National Park. We had a spectacular view from the windows of our room. Chao-Lung has worked often in the national park here and was able to arrange the necessary permits for us to catch bats in his harp trap, and rodents in 30 sherman traps. We set these in the grassland and forest near the visitor centre about 500 metres, and a half hour drive, up the mountain. 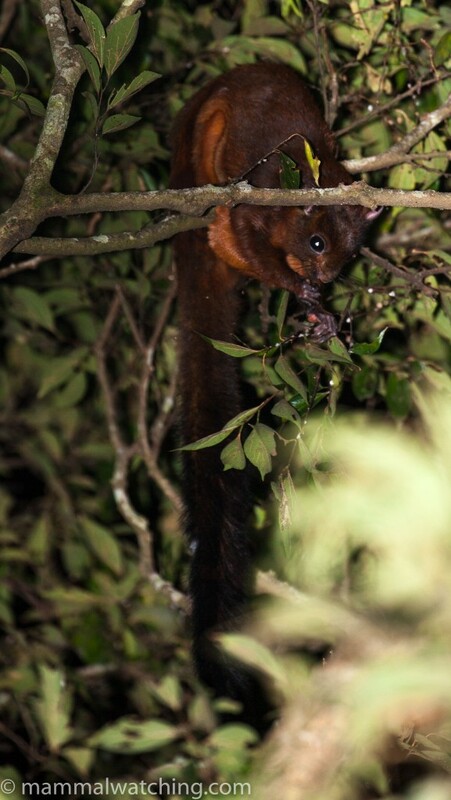 There is some lovely looking forest up the mountain, interspersed wth conifer plantations, and Chuck thought the road would be good for Red and White Giant Fling Squirrels and even Serows, which have been recorded on camera traps. We spent around five hours spotlighting on our first evening. 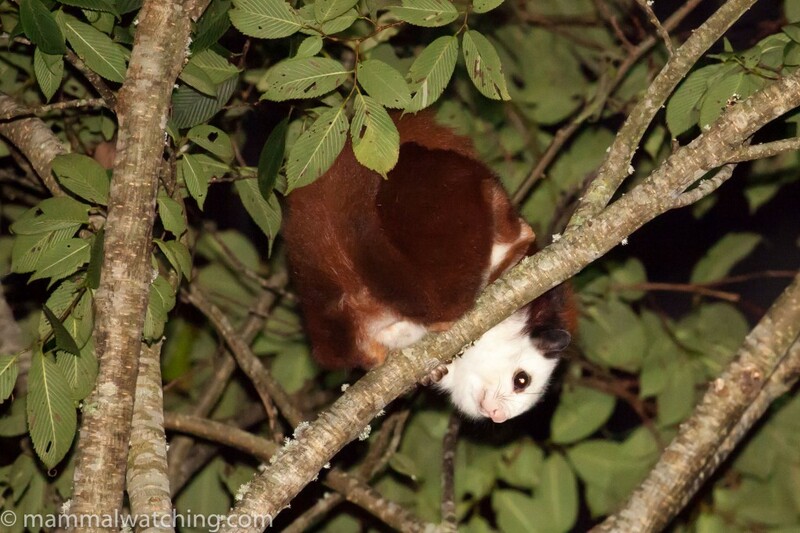 It took us around three hours to find a flying squirrel: they do not seem as prolifically common here as they were in Dasyueshan, according to both John Wright’s and Dominque Brugiere’s 2016 reports. Chuck later speculated that there might be too much hunting in the forest outside of the national park for the squirrels to thrive here. But when we found a squirrel it posed, seemingly unconcerned by the light, for 30 minutes. Walking and driving up the road I used my heat scope and spotted a couple of Formosan Horseshoe Bats, dangling from vines that they were using as a hunting perch. Their identity confirmed by Hao-Lung’s Anabat. The most exciting find of the evening was a Chinese Ferret Badger waddling up the road. We followed it, on foot, as it travelled along the drainage ditch at the side of the road. A smart little beast. Though I have seen other species of ferret badgers a couple of times I have never had a long look at one. 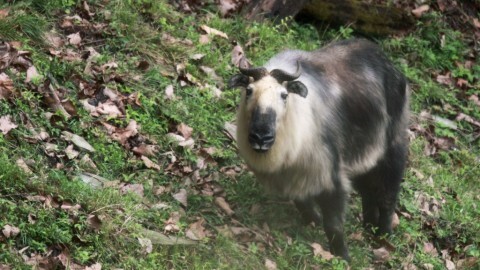 But there was no sign of a Formosan Serow and I think you would be very lucky to see one here. Dasyueshan seems the place for these. We checked the harp trap at around midnight, and had four bats of four species. 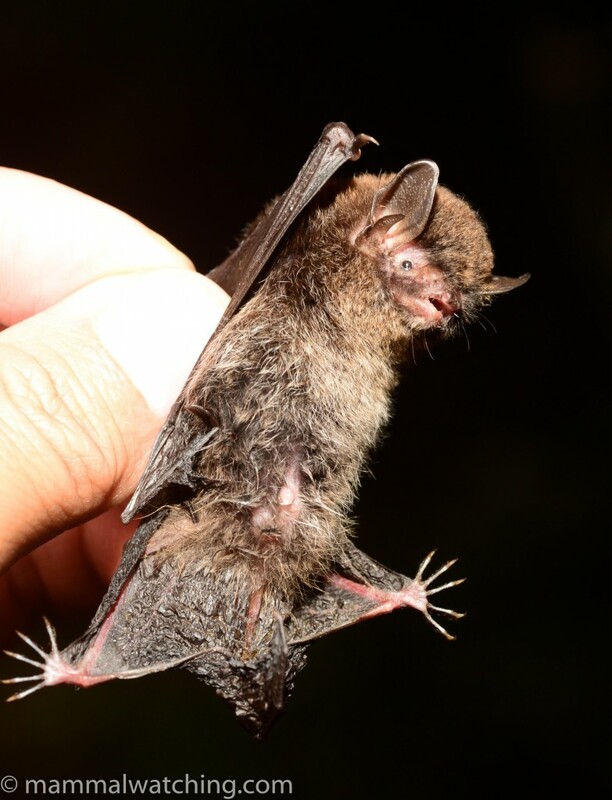 This little myotis is a newly discovered species, not even formally described yet: Taiwan Long-toed Myotis. 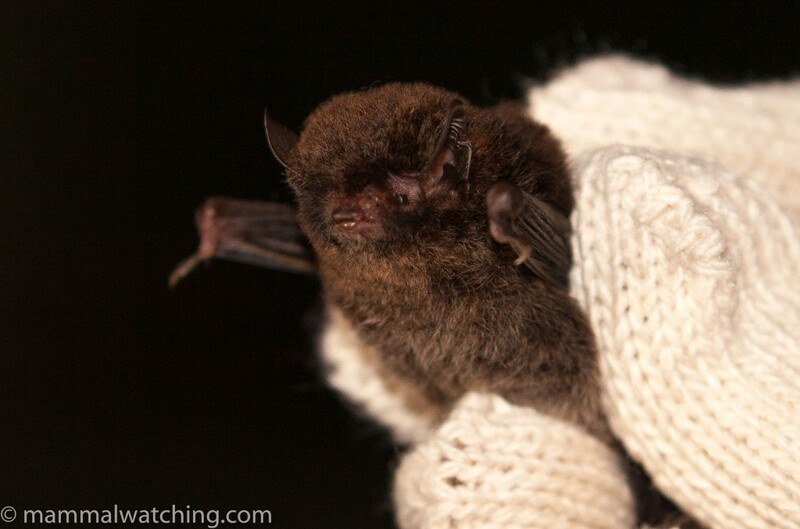 We also caught a Formosan Lesser Horseshoe Bat. Some see this as endemic to Taiwan – Rhinolophus monoceros – but for the moment I will follow the IUCN and call it a subspecies of Least Horseshoe Bat, Rhinlophus pusillus. Formosan Lesser Horseshoe Bat, Rhinolophus pusillus monoceros. Photo Kuan-Chieh Hung. 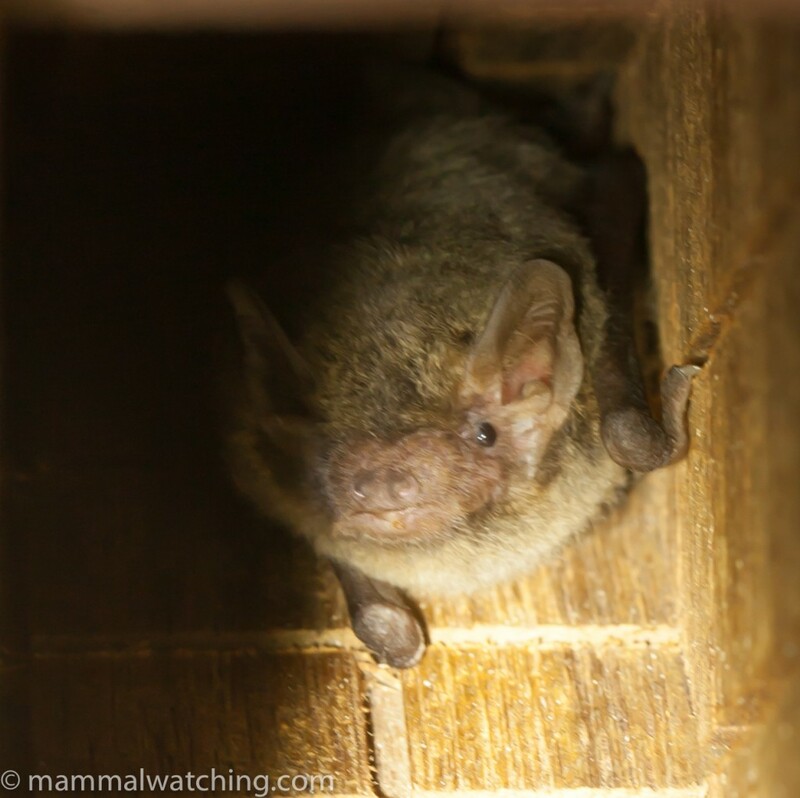 A second myotis looked very similar to the first. 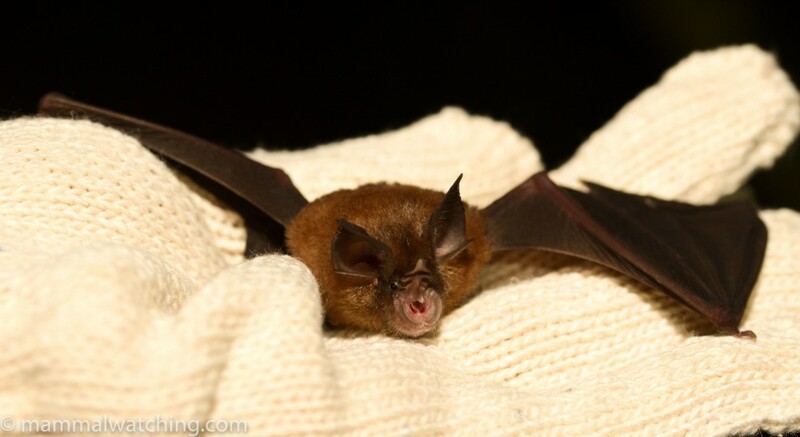 But after close inspection Chao-Lung pronounced it a Taiwanese Broad-muzzled Myotis, Submyotodon (formerly Myotis) latirostris. 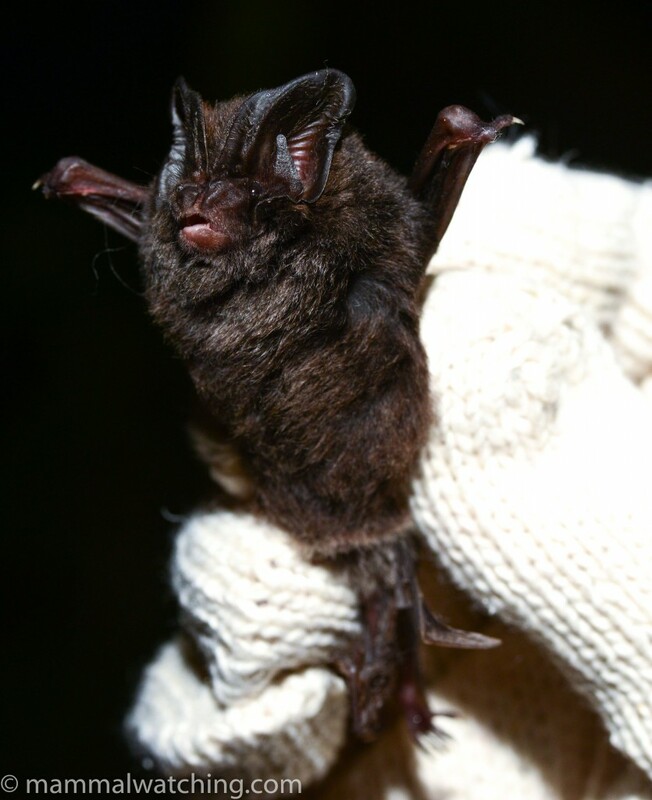 Taiwanese Broad-muzzled Myotis, Submyotodon latistrostris. Photo Kuan-Chieh Hung. But best of all was a rare capture: an Eastern Barbastelle. 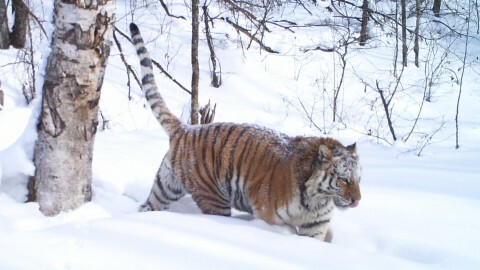 A very cool species that Chao-Lung only sees about once a year. Four bats, and all new for me. Eastern Barbastelle, Barbastella leucomelas. Photo Kuan-Chieh Hung. Unfortunately we didn’t catch any new bats in the morning, and none at all the next evening after the weather changed and we tried the harp trap in a different spot. Small mammal trapping was excellent both nights. 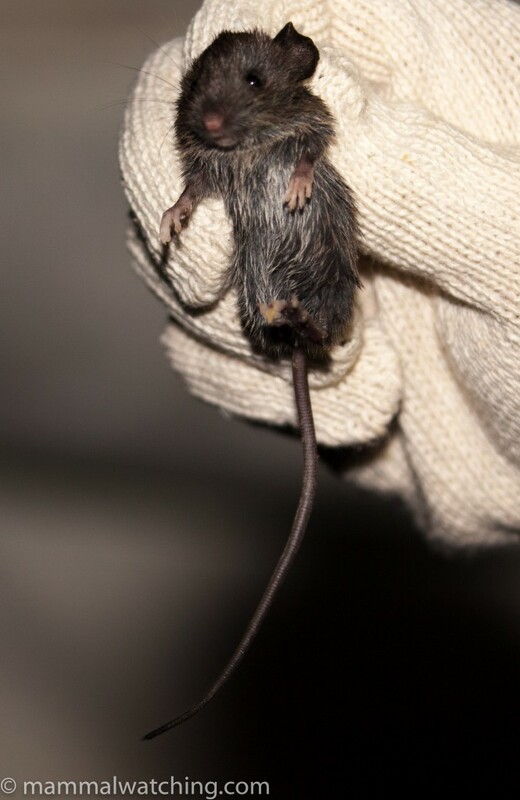 We caught many endemic Formosan Field Mice. Along with a few Oldfield White-bellied Rats, also endemic. 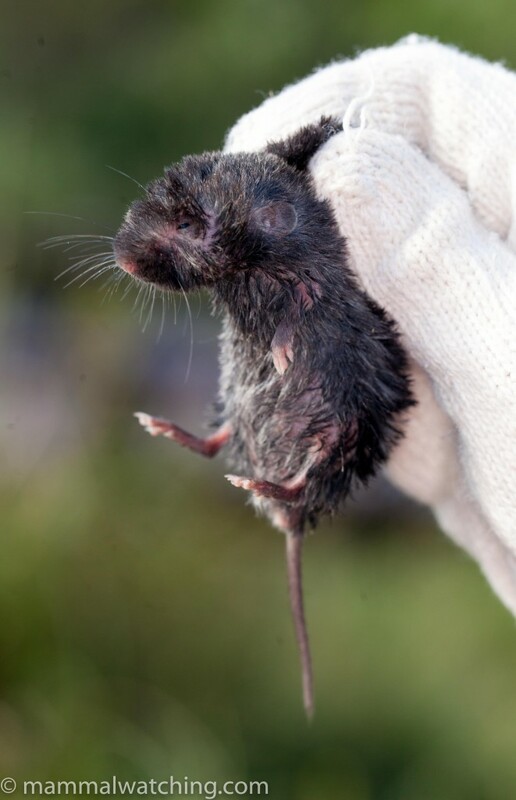 On the second night we also caught a couple of Black-bellied, a.k.a Pere David’s, Voles. A lovely few days in a country that was a very pleasant surprise. It’s a pity we missed the Formosan Serow, but I am sure I wouldn’t have had we not been hit by two typhoons (the first time in ten years they have come so close together Chuck proudly told me!). 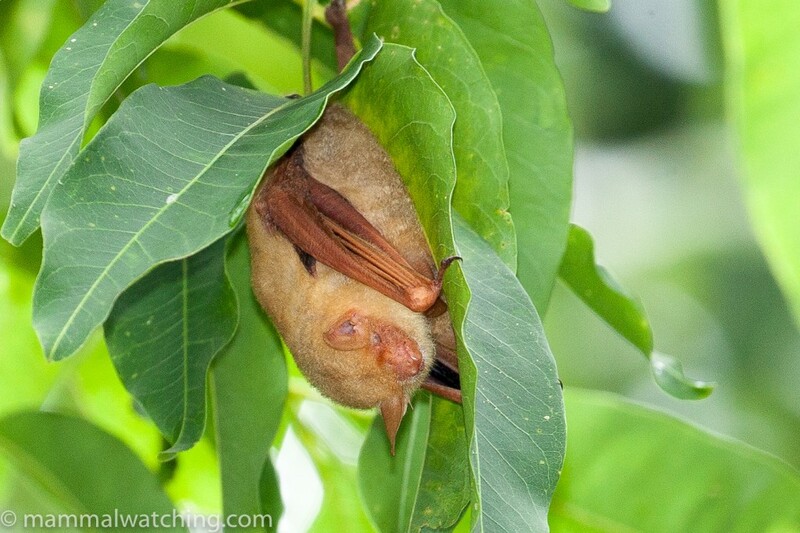 I am already planning a brief return to Taiwan next year to try to catch up with that species and a few more bats. 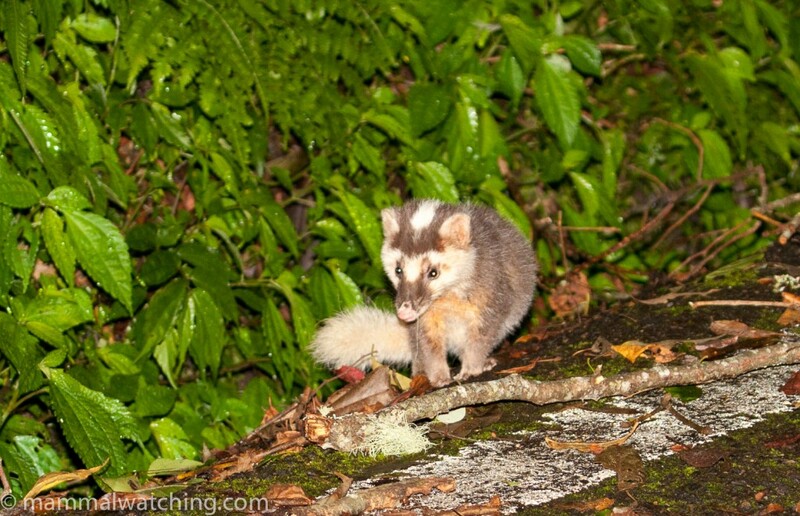 There are a number of other mammals here worth looking for, including Chinese Pangolin: while uncommonly seen in Taiwan, my hunch is that they are commoner here than most places. A big thanks to Chuck and Chao-Lung for a great trip! 18 species, 12 of them new for me (marked with an F), and a good chance several of the others will be split one day.